When we enter a house, we are being welcomed by that space called the foyer. Some foyers are long and spacious while others are just small. But we always make sure that the foyer is well decorated so that our guests will feel very much welcome when entering the house. Most of the time, the foyer will also give the guests a first impression of your home and the type of people who lives in it. One important item in the foyer could either be a bench or a table. But most of the time, we can see a foyer table. Yes, it might be a simple table but we can actually give a huge difference to a space through that table. 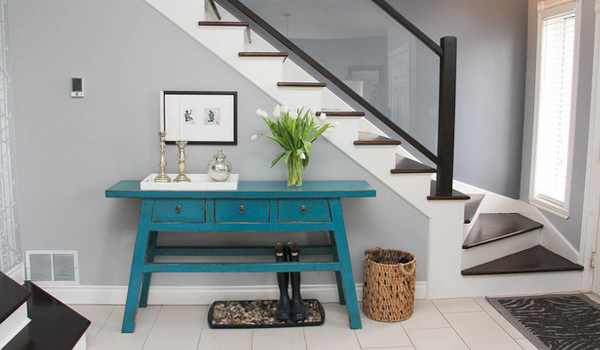 A foyer table could be decorated in many ways. You can stick to a simple design or make it very elegant and sophisticated. When designing, always remember that the place will be the first spot that the guests will see and even if it is at the entry part, you have to make sure that its design is coherent to the rest of the house. So, today, we will give you some tips of how you can decorate a foyer table as if some professional designer did it. First step is to choose your table. You can get a round table and place it in the center for a spacious foyer. A round table can break up the boxiness of a space. You can also get a rectangular table and place in near the wall. A rectangular table is usually the one used since it doesn’t occupy much space. You choose the kind of materials for the table too. It could be a wooden table or one with glass top and others. You can even revamp an old table if you want to. 2. Don’t forget to scale. Always make sure that you consider sizes. 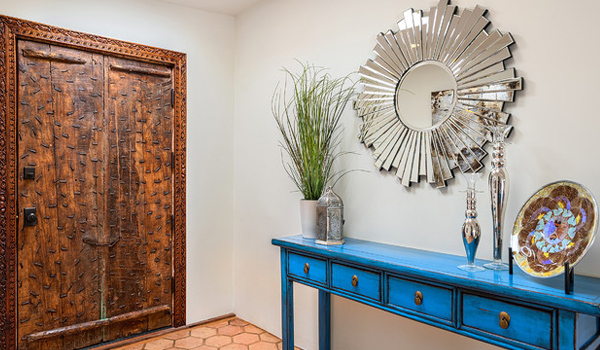 The size of your foyer could tell you the kind of accessories and table you could use. A long, narrow table could open up your floor space and would create a tableau. 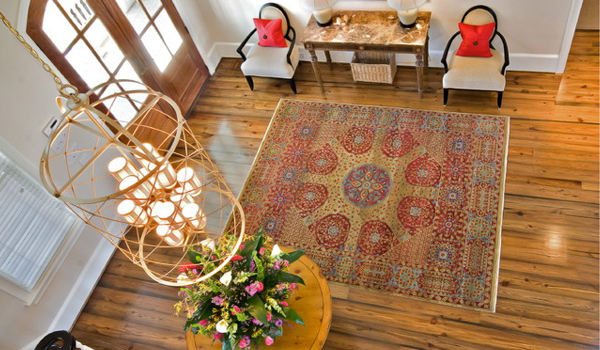 For a small foyer, you can add a small round table into a corner. If your foyer has a staircase, you can add a table under it too. 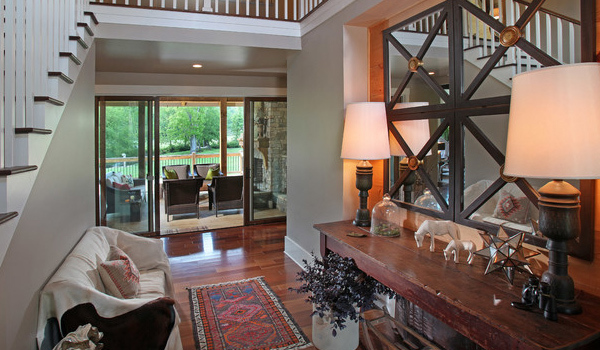 You can also use two tables for a large foyer. Combine a round table at the center and a long one near the wall. 3. Hang a mirror above the table. You may have observed that some foyer tables have mirrors above them. This will attract the eye and makes the table your focal point. 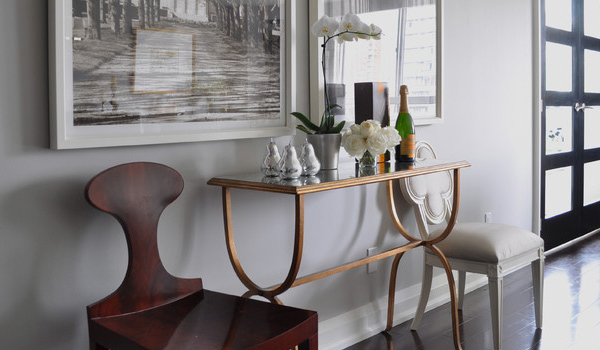 Use a mirror that’s functional with a beautiful frame. You don’t have to place the mirror at the center. You can also hang it on one side then balance the look with a lamp on the other. Or you can also place the mirror to the adjacent wall too. 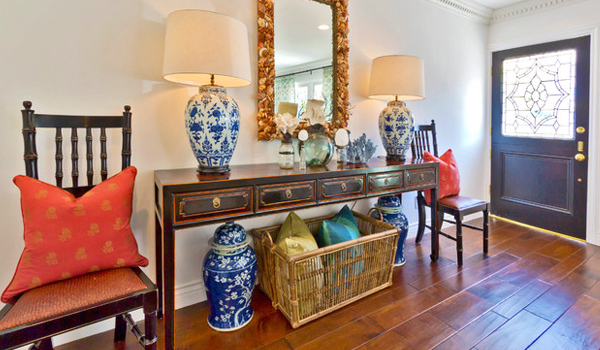 When you place a lamp, it can also make your table the focal point in the foyer. You can place one lamp only or you can add two matching lamps. See to it that the lamps have low-wattage bulbs because the light would be merely for aesthetics that adds drama to the area. Pick decorative lamps. You can go for those with lovely opaque shades that could cast glowing light to the area or you can get those with stylish base design. 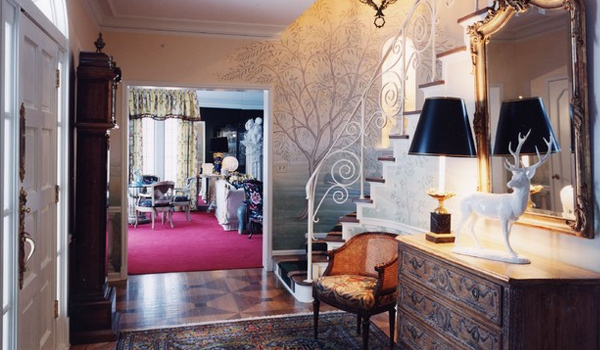 Make sure that your lamp is tall enough to cast illumination beyond your foyer table. 5. Fresh flowers are refreshing. 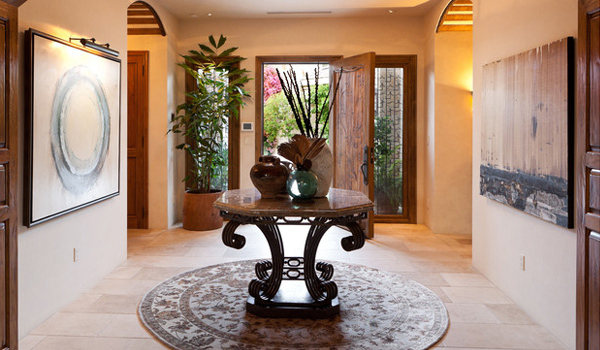 If you want to bring in a natural and refreshing feel to your foyer, add fresh flowers to it. Make sure that you change the flowers before they rot. Also, change the water in the flower vase everyday to make sure it will not cause a foul odor in you foyer. Be creative with your flower arrangement. Using fresh flowers will definitely bring your foyer table’s design to the next level. 6. Use jars or vases. You can also decorate your table with jars and vases. If you are a jar collector, choose those that look great together. You can combine different colors, designs and sizes of jars. Or you can also stick to one color or one design for the jars too. Experiment the arrangement of these items. For sure, you will come up with one that would add more beauty to your table. You can use one of the jars as a container for your fresh flowers too. Or, you can use synthetic flowers. Get some lovely photos of the family and frame it. Then place them on the table. Some just place one or two framed photos while others add more. It depends on you. You can make it a mini-gallery of family portraits if you want to. Make sure to pick beautiful frame designs. If you already have decorative vases or jars or lamps, you can keep the frames of the photos simple. This way, the attention will be drawn to the photos and not the overly decorated frames. Avoid adding plenty of small items in your foyer table because this will just crowd the table. You can add some but put it to minimal. If you want to display some small items, this will look better if you raise them up on a floating shelf or place them in other areas of the home so you can showcase your collection. 9. Add some personal touch. Your foyer table will look lovely and unique if you add some personal touch to it. Accessorize with some items that may reflect the kind of life you have or the kind of family you have. You can even use a crystal bowl, a woven basket or any item that you can just remove from the display. Candles in various heights would also be a good idea as it adds a scented welcome when lit. Then add some personal collections too or some stuff that are valuable to you. Even books would look great on the table. 10. Decorative lighting adds drama. Yes most foyers look more amazing with a stunning lighting. You can add one above your foyer table. Or at the center of the foyer. 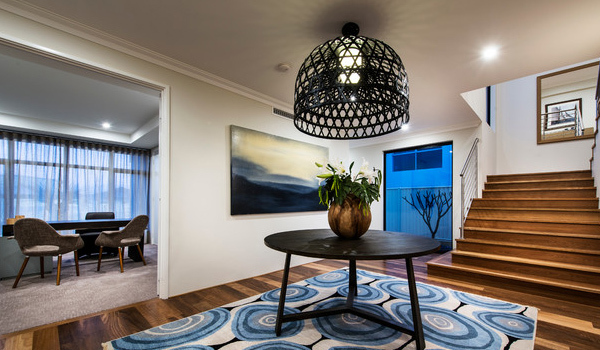 Most of the time, round foyer tables are being paired with gorgeous pendant lights or chandeliers. No matter how simple the foyer table is, it would look lovely with the lights. 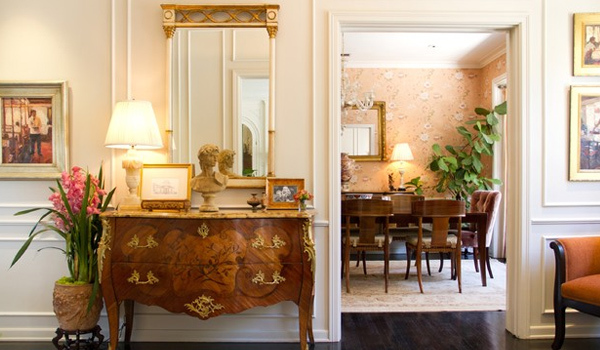 You can update your foyer table from time to time. A holiday or seasonal motif could keep your tabletop arrangements evergreen. Your guests will surely be impressed to see a new foyer table design from time to time. I’m sure you are also excited in decorating your foyer table too especially if you find new ideas from the web. We hope you found this tips helpful and don’t forget to share it with your friends too!